Beautiful 3 stone diamond ring, set with central oval brilliant diamond between 2 outer round diamonds above solid shoulders. 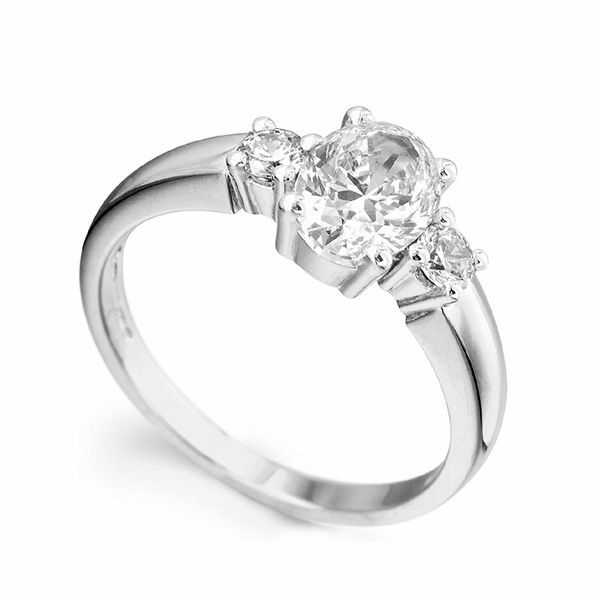 Three Diamonds are perfectly claw set in this intricate three stone trilogy Engagement Ring. The central stone is an Oval cut Diamond, and the two either side are Round Brilliant cut Diamonds, which compliment the larger stone perfectly. We can create your ring for you in a number of different precious metals, including Palladium, Platinum, 18ct White Gold, 18ct Rose Gold and 18ct Yellow Gold. (All of our gold options are available in our Fairtrade Gold too). Choose the total carat weight you would prefer for your Diamonds from the drop down menu too, and we will create your perfect ring for you. Your ring will arrive with you in our bespoke packaging and direct to your door with a slim pocket box for your proposal and the added reassurance of our 60 day returns policy and free size adjustment if needed.